uuid : 773c46c4-ae6f-478d-842d-748a05c9a8e0 templates_id: 119516 templates_uuid: "87390cf4-9d7b-4331-820e-fc5cf2e54aa1" title: "Notice to Break Clause - Tenancy Break Clause - Evict Business Tenant" display_name: "Break notice" meta_keywords: "Tenancy break notice" description: "
Make sure you meet the necessary conditions when as a tenant you want to end your lease early, with this simple interview to create a break clause notice. Use this break notice if you\'ve checked the lease to make sure you have the right to break, you\'ve satisfied any conditions and you\'re within the time limit to service a break notice. 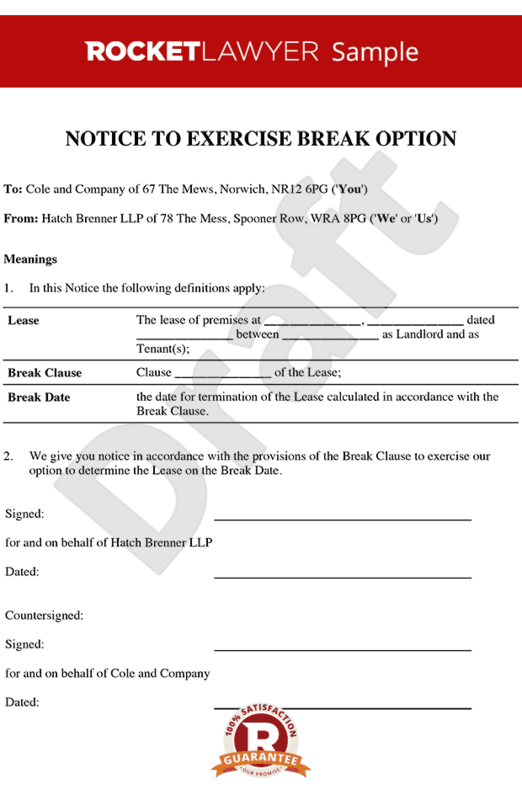 This break notice will ensure you\'ve taken all the relevant steps when a lease is ended early under a break clause. What is a break notice? A break notice is a document sent to a landlord requesting that the lease is ended in accordance with the break clause in the lease. Do I need a break notice? You will need a break notice if your lease has a break clause and you want to notify the Landlord that you want to end the lease early. \r\n\r\n\r\n\r\nWhat if I do not understand the break date in the lease? Ideally the break notice should include the date when the lease will end. If the lease is not clear you can repeat the wording in the lease in the break notice. Who can sign the break notice? Unless the lease states that the notice must be given as a deed, the break notice will be valid if it is signed by a director or other authorised officer of the company. Who do I send the break notice to? The break notice should be sent to the landlord at the address in the lease and also the registered office if the landlord is a company. It should be sent in duplicate so that the landlord can sign and return one copy by way of receipt. The landlord\302\222s agent should also be sent a copy. Where do I send the break notice? Unless the lease states a particular method of service, the notice will be valid if it is delivered by hand or sent by post. If using the post, it should be sent by recorded delivery and if the notice is delivered by hand obtain a written note of delivery from the person it was handed to. This document is governed by the law of England and Wales.
" created_timestamp: "2018-10-08 04:36:35.0" modified_timestamp: "2018-10-08 04:36:35.0" active: true created_by: 102 modified_by: 102 dcm_id: 245 url_slug: "Break-notice" meta_description: "Create a notice to break with simple guidance from Rocket Lawyer. Use this break notice if you\'re a tenant and have a break clause in your lease allowing you to end the lease early. Try this break clause notice." time_to_complete: "10 minutes"
Make sure you meet the necessary conditions when as a tenant you want to end your lease early, with this simple interview to create a break clause notice. Use this break notice if you've checked the lease to make sure you have the right to break, you've satisfied any conditions and you're within the time limit to service a break notice. This break notice will ensure you've taken all the relevant steps when a lease is ended early under a break clause. What if I do not understand the break date in the lease? The break notice should be sent to the landlord at the address in the lease and also the registered office if the landlord is a company. It should be sent in duplicate so that the landlord can sign and return one copy by way of receipt. The landlords agent should also be sent a copy. More than just a Break notice template, our step-by-step interview and guidance makes it easy to create your document. Easily create online, download, print and sign your free Break notice in minutes. This document is also sometimes called: Tenancy break notice.